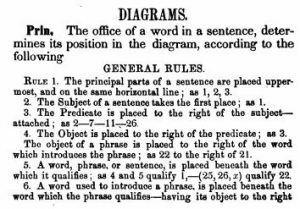 Sentence diagramming is still popular in some American schools, though the picture is complicated and it seems to be disappearing. Florey, Kitty Burns. 2006. 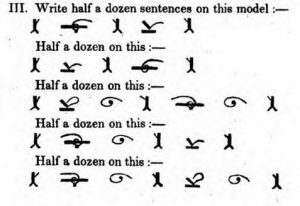 Sister Bernadette’s Barking Dog: The Quirky History and Lost Art of Diagramming Sentences. Melville House. I benefitted greatly from Brittain 1973. Brittain, Richard Coulter. 1973. 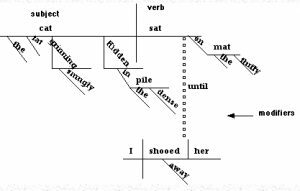 A critical history of systems of sentence diagramming in English. University of Texas at Austin PhD. The grammars listed below are only a few of those discussed by Brittain. 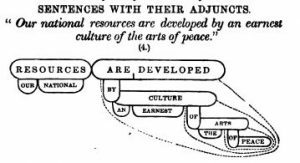 Brittain also introduces the nice term diagrammarian. I learned about Brittain’s thesis from Nicolas Mazziotta, who heard about it from Karl Hagen. Most of the grammar books discussed by Brittain are now freely available for download as pdf files on the internet – a wonderful resource! ‘Scheme’: The brackets [ ] enclose the major section ; the parentheses ( ) the minor — and the commas denote the ellipses in the sections, while the number of words to be supplied to render the section complete, is denoted by the number of commas, the exact words which fill the ellipses, may be found in the preceding exercise which is a key to this. for some discussion, see Mazziotta, Nicolas, and Sylvain Kahane. 2017. “To What Extent Is Immediate Constituency Analysis Dependency-Based? A Survey of Foundational Texts.” (Depling 2017) Mazziotta and Kahane quote this diagram for The man who is mild in disposition never fails to make very many friends. 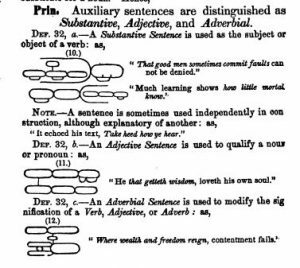 In 1839, Oliver Peirce wrote The Grammar of the English Language. (New York, NY: Robinson and Franklin.) This doesn’t mention James Brown (though it often criticises Goold Brown – see below) or Barnard, but includes a number of innovations which don’t seem to have had any uptake. 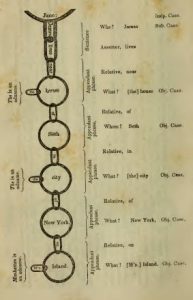 Interlinking bubbles round words distinguishing the main content-bearing words from the grammatical linking words, as in this treatment (not called an ‘analysis’) of James lives near the house of Seth in the city of New York on Manhattan Island. Note how the system simply follows the order of words ignoring their dependencies. Numbers used to show basic (non-poetic) word order – not syntactic rank. Barrett, Solomon. 1845. 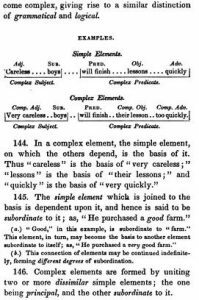 The Principles of Grammar: Being a compendious treatise on the languages, English, Latin, Greek, German, Spanish, and French. Founded on the immutable principle of the relation which one word sustains to another. (Revised edition 1857). Cambridge: Metcalf. Trees for various sentences, starting with The midnight moon smiles serenely. with vertical lines for ‘adjective sentences’ and ‘adverbial sentences’. but the main clause’s verb and its subject are written on the same line (reflecting the traditional equal-ranked subject-predicate analysis). 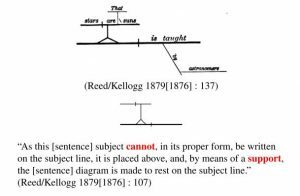 In 1877, Alonzo Reed and Brainerd Kellogg published a system using lines instead of balloons, and even more like Billroth’s 1832 system (though this similarity is probably coincidental). Reed and Kellogg’s system is still used and taught in at least some American schools, and even has a website for automatic analysis. 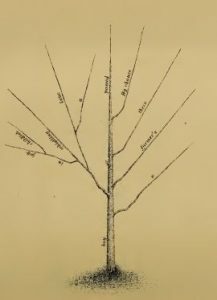 Go here for a much more detailed and thorough survey of 19th century American diagramming systems, including Reed-Kellogg diagrams. This grammar (Gauss, Charles & B.T. Hodge. 1890. A Comprehensive English Grammar for Schools, Colleges, Families and Private Students. Baltimore: Pan Publication.) 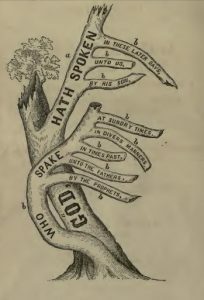 is distinguished by the prominence it gives to the ‘tree’ metaphor (following Barrett 1845, above, but apparently independently of it). This is the tree (from page 330) for By chance there passed a farmer’s boy, whistling a tune in childish joy, but as an analysis of the sentence’s structure it is, of course, a disaster – much worse than Barrett’s trees. Sheffield , Alfred Dwight. 1929. 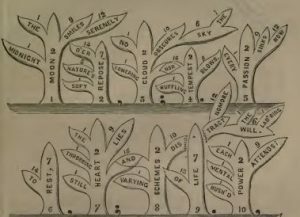 Command of Sentence-Patterns. An English grammar on new principles. Chicago: Scott, Foresman. The main interest of this grammar is that it anticipates the structuralist analyses introduced by Bloomfield four years later. Here are some examples of his analyses.